Monday July 16, 2018: Liam asks Hope for more time, Sally protests her innocence, and Xander learns Zoe’s followed him to Los Angeles. At Forrester Creations, Hope tells Liam she can’t step aside for Steffy. Liam needs more time. Just then, Sally busts in with Katie and Thorne behind her, proclaiming her innocence; she didn’t deserve to be fired. Hope says, “I didn’t fire you.” Thorne reveals he did – she was a threat to the company and to Hope. Liam, Thorne and Katie fill Hope in on the threatening comments posted on the website as Sally continues to insist she’s not the person responsible. Hope’s confused as to why she’s just hearing about this now. Katie assures her they took care of it, but Sally disagrees. Liam warns her not to give them a reason to call the police. Sally thinks maybe they should because the guilty party is still out there. In the Forrester Creations design studio, Zoe listens in the shadows of the clothing racks as Emma asks Xander if he’s ever been in love. Xander carefully replies that he thought he was…but it didn’t work out that way. He goes on to describe the wild and exciting relationship, which started to get intense – his girlfriend became possessive and he ended it. Emma learns that it was part of the reason he came to L.A., to get away from her. Xander muses it was a shame since his ex was a talented person. Emma gets called away. Once Xander is alone, Zoe flashes to being in bed with him. Xander spots her and asks what she’s doing there. Zoe notes he’s as hot as ever. He wonders how she found him. 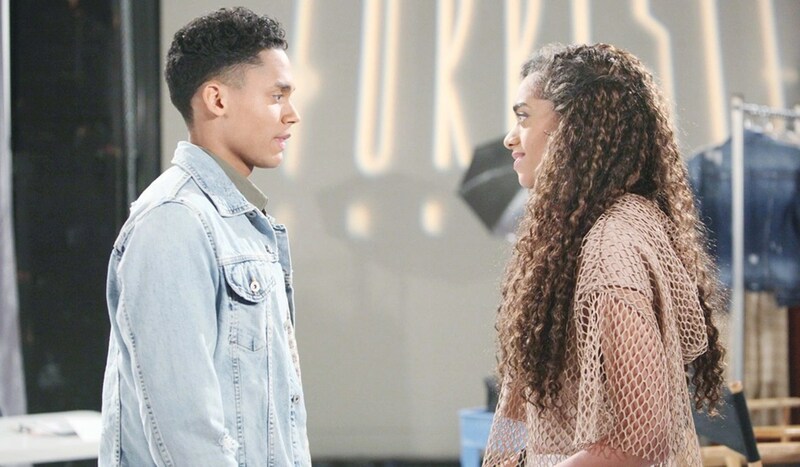 Zoe reminds him he always spoke of his cousin Maya at Forrester, and that they had plans to come to L.A. together until he dumped her. She invites him back to her place, but Xander balks. Zoe acknowledges that showing up there seems a bit extreme, but he just disappeared and wouldn’t talk to her. Xander advises her to go back to London, and walks away. Outside, Zoe watches Emma get into her car and follows her. In the boardroom, Xander has joined the group discussion involving the accusations against Sally. He asks to see the posts – it’s important – he believes Sally and may know who made the threats. Thorne grudgingly agrees, and pulls up the messages on his laptop. Xander reveals that he has reason to believe the messages aren’t for Hope, but for Emma. At Café Russe, Emma talks to Danny the bartender about planning an event before bumping into Zoe again. Emma marvels that they ran into one another again just as Zoe predicted. Zoe convinces her to sit and chat and steers the conversation around Xander – she wants Emma to admit she’s hoping Xander will become her boyfriend. Emma doesn’t want to rush anything. As Emma leaves, Zoe watches her go and looks thoughtful. Xander realizes Zoe’s had contact with Emma.